Welcome back to our weekly game of pin the tail on the sputnik, also known as What Am I? 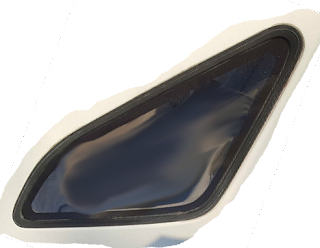 Identify the donor of this car part and achieve internet fame. Front quarter window on a civic? Bubble window on a custom van? you see he's blurred inside the window there - smudged, technically - i think it is rotated 60 degrees CCW and we're looking at the (does a quick translation from RHD to LHD) driver's side with the car headed to the left - early 70's opera window on a midsized Oldsmobile or something - "sporty" version with vinyl delete - Hurst Olds? Is it one of those contraptions that allows women to pee on trees when camping? The window in back of the window behind the window that the driver can roll down on a Merkur XR4Ti, you know, the redundant window. Try the veal, it's del-i-cious. You mean the gray stuff? And don't forget to tip the waitress.